This is another view of the University of Beer in Davis, California. I was there at the end of August, as I needed to go downtown to spend some time in the Avid Reader bookshop. I haven’t been in there in a while, and was in the mood where I just wanted to look through all the literature on the shelves. I bought a copy of ‘War of the Worlds‘; I’ve never read ‘War of the Worlds’, and when I opened the book the first word I saw was ‘Edgware’ so it was a sign I needed to read it. I actually worked in the Avid Reader years ago, when I first came to Davis. I still love the smell of the books. I thought about sketching in there, I haven’t done that in a very long time, but it was getting late so I went and sketched this bar a block away. I had wanted to add more colour, but was taking so long drawing. I had a couple of very nice beers there though. This was a test of perspective, with vanishing points at 45 degrees, and some curvilinear lines. Wonky in places (nothing to do with the tasty beverage, more to do with the tedium of drawing long lines. There seemed to be a fair bit of 1990s music being played. Including that utterly tedious Two Princes song that was on the radio constantly in 1993. 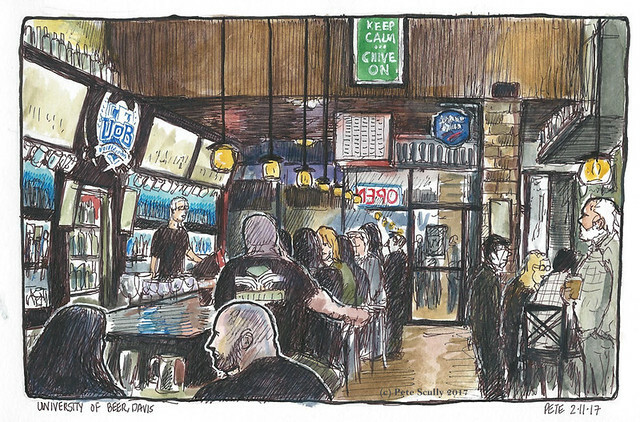 This bar is pretty typical of Davis – busy at some points, almost empty at others, then a bit busy again, then very few again, so I drew whoever was standing or sitting when I looked in that particular part of the space; I suppose I drew the average number of players. University of Beer; see also the ‘College of Cider’, the ‘School of Shandy’, the ‘Polytechnic of Porter’, the ‘Institute of Inebriation’, the ‘Academy of Ale’, etc and so on. Saturday afternoon meant sketching. I spent the morning coaching my son’s soccer team (did I mention I am coaching my son’s soccer team? We are called the Blue Torpedoes this Fall, and AYSO is a lot of fun) (I designed the badge again) (by the way when I say ‘soccer’ you know I really mean ‘football’ right, I’m only saying that because that’s what they say) (ten years in America won’t break me) (although I did in my weekly handout point out to the team that ‘soccer’ is in fact an English term derived from ‘Association Football’, it’s also a sport from England so you know, listen up, I know what I’m talking about), and then in the afternoon I opted against going to the UC Davis ‘Brewfest’ because ‘tired’ and ‘expensive’. The Aggie’s homecoming football game was on Saturday (obviously you know when I say ‘football’ I mean ‘American football’) (actually so people understand me, over here I always call it ‘American football’, or ‘gridiron’, or ‘helmet-ball’ or ‘space-rugby’), anyway my family all went to see it but I opted out because ‘sketching’. It was lovely weather. I cycled downtown with the intent of drawing something beautiful. I have a book out you know, so I’d better get sketching. I didn’t sketch enough in September (because ‘busy’ and ‘lazy’), and I didn’t want anyone buying the book and then looking up my site and it all being Lego that I drew two months ago. So I have been busy sketching the past week or so, and will be posting those soon. Well, I couldn’t decide upon ‘beautiful’ but this corner downtown of 3rd and F Streets had the sunlight hitting it in just the right way, with those two trees looking a lot barer and autumnal than other ones. Leaves were tumbling gently; fall is in the air (you know when I say ‘fall’ I mean ‘autumn’). This is the University of Beer, which I have sketched before on the inside a few times, and it was busy on a Saturday afternoon. I even saw someone wearing a USA 94 football shirt (alright, soccer jersey), the one with the wavy red stripes (think “Alexei Lalas’s beard”), which made my football-shirt-geek self jump up and down with excitement. Though I do have the USA 94 Ireland shirt (the one Ray Houghton wore when he scored the winner against Italy), I was actually wearing the 1995 Ireland Umbro shirt (the one Father Dougal used to wear to bed on ‘Father Ted’). The mid-90s, ladies and gentlemen, a high point for me. I should have sketched him, or rather his shirt. 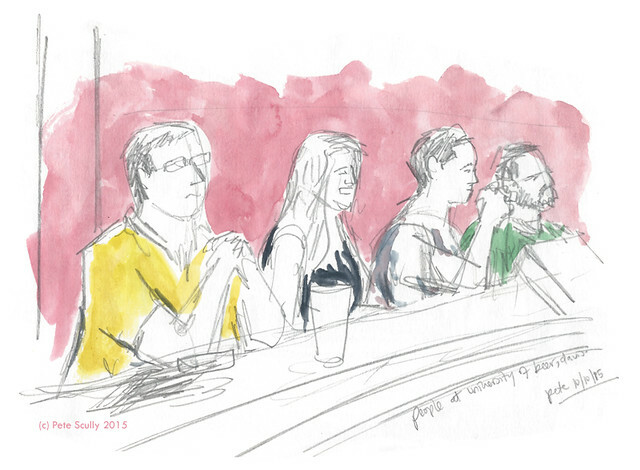 I did pop in for a pint post-sketch though, and decided to give my pencil a quick run-out with a five minute sketch of the afternoon drinkers cooling off from the heat. Yes, Autumn is coming, but it’s still in the 90s. 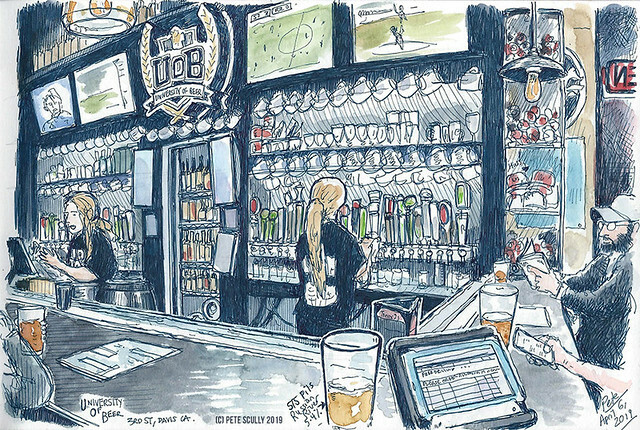 To round off all the pub drawings here is another panoramic I attempted last weekend at the University of Beer, on 3rd & F (Click on the image to see the bigger picture). 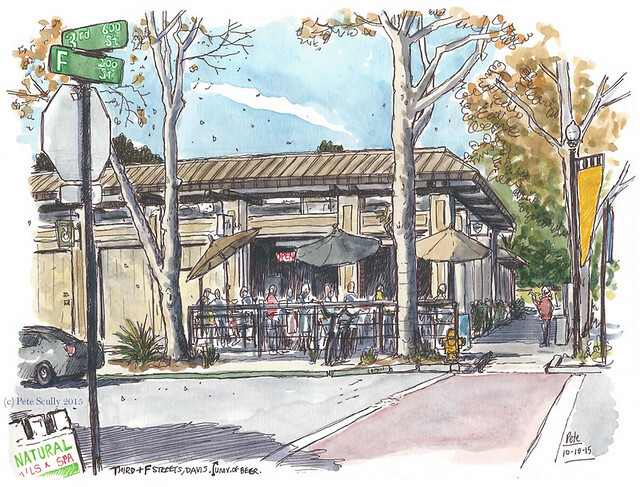 This is one of the newer places in Davis and is a beer-geek’s dream; I have sketched it before from the far side of the bar (see image at the bottom of this post) but didn’t quite manage the two-page panorama, so I came back to sketch that far wall. As you can see, it is worth it. they have beer signs, both metal and mirrors, from all over the world (though mostly the US and Belgium). It was a very hot day and I was just not motivated for outside sketching, so I got a footy magazine (the Premier League is finally BACK! Hallebleedin’lujah!) and popped into the ‘UoB’. After about ten minutes looking through their extensive menu and studying the beer taps I opted for a Monty Python’s Holy Grail ale – I’ve never had one before, it was very nice, and made me want to put the movie on when I got home. One of the barman had an Arsenal hat on (backwards; I suggested it maybe should stay so) and we discussed the chances of our teams in this coming season (as you know, I’m Spurs all the way). I started sketching, and quickly realized there are many more details in this place than I knew; they now have loads of beertaps lining the ventilation pipes near the ceiling. To be honest it was nice to sketch some people – the three fellows to my left were sharing stories about Davis in the olden days, while further down the bar there were other conversations of varying degrees of volume; but on the whole this was a very pleasant place to spend an afternoon. One of the barstaff remembered me from the last time I sketched here (he is in fact in both sketches, so I had him sign the second one) and I spoke to him and one other about my favourite Belgian beers (Charles Quint and Fruit Defendu, if you’re ever wondering). I followed on from my Holy Grail ale with a really nice beer called Summer Solstice, by Anderson Valley, a creamy brown beer with a very caramel-like taste, and it was delicious. If Quality Street made beer, it would probably taste like this. I had their Winter Solstice beer here back in February and that too was incredible. This week in fact is Davis Beer Week, a celebration of craft beers in Davis, and so if you’re in Davis you should pop by here, or de Vere’s or any of the other great beer spots in town. This has really become a beer-lovers town lately, and it’s not surprising – UC Davis has an excellent beer-science facility. People here really know their Chit. 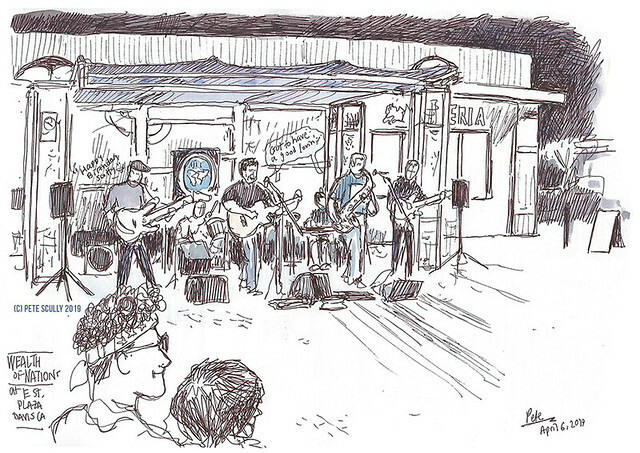 I must point out – this sketch was done in a Seawhite of Brighton sketchbook I picked up in London. Smooth paper and takes a light wash, not as robust as the watercolour Moleskine but I’m looking forward to playing with it some more. After a Saturday morning of making pancakes, watching football, playing superheroes, Cars Monopoly and Play-doh, I went downtown to watch Iron Man 3. I have spent a lot of time lately drawing different Iron Man armours for my son to colour in, so was looking forward to watching the movie itself. 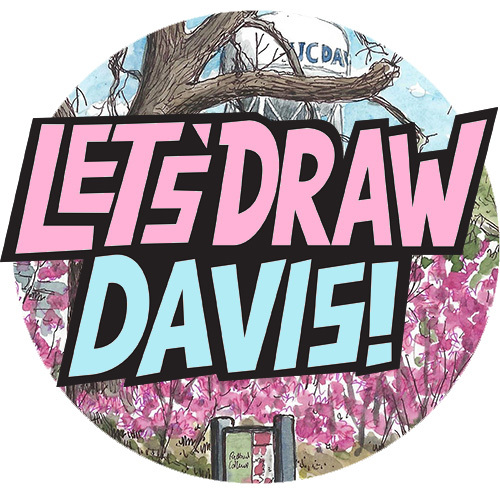 So was everyone else in Davis it seems; the show I wanted to go to was already full, so I got a ticket for the next one and went off to do some sketching. 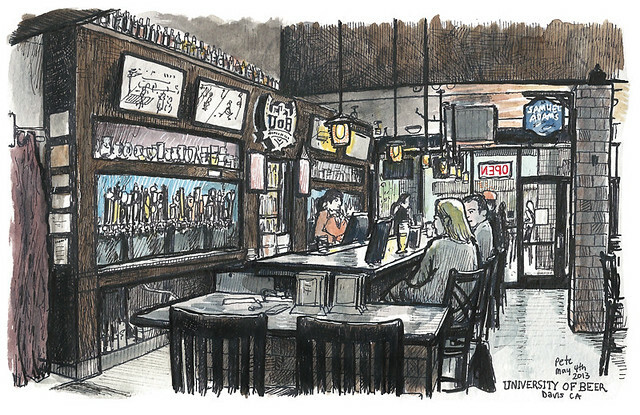 It was too hot to sit outside (90s; I know, in a couple of months that will sound chilly) so I popped into the University of Beer, a newer bar in Davis devoted to all types of beer, and drew the bar. I should have drawn the wall on he right as well, which is covered in colourful beer signs, but this is all I had time for. I went off for a curry for dinner, and then off to the movie, which was fun, and long.